Paperpokés - Pokémon Papercraft: SYLVEON - " MERRY XMAS :) "
SYLVEON - " MERRY XMAS :) "
Interesting Facts: Sylveon is a quadruped, mammalian Pokémon covered primarily in pale cream-colored fur with pinkish feet, ears, and tail. There are two bows on its body, one on its left ear and one around its neck, from which two feelers adorn it. The bows are pale cream with pinkish centers, while the feelers are pale cream with pinkish and blue tips. It sends a soothing aura from these feelers to calm fights, and will also use them to "hold hands" with its Trainer. It has short, slender legs and small paws with three visible toes on each foot. Its eyes are blue with white pupils and no visible sclera. When its mouth is open, two pointed teeth can be seen on its upper jaw. Its furry pinkish tail is slightly curved in a crescent shape. NOTES: This model is simple and easy to build. Start with the ears, head, body, etc. Close the model at the flapless part. 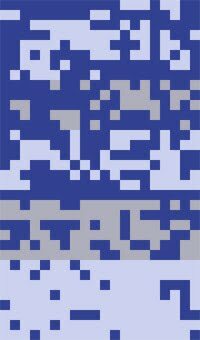 Textures included. The bows can be shaped as wished. Have fun. I am so happy to see this! I was waiting on it to make for a friend :) Starting on it right away! Oh my, I really like Sylveon, Though I don't like pink, Shiny Sylveon is so amazing! Ever since I saw the test build on DeviantArt by one of my fellow friends last year I was eager to see it released! And it happened! The only problem i had were the hind legs. I didnt have trouble with that with the Glaceon I made before, so Im not sure what happened there. But other than that, this is an amazing model guys! <3 I'm in love. 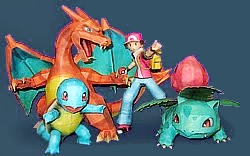 I hope we can get some Rotom papercraft. They would be very easy crafts, dont you think? This is so cute!! Thanks for all the hard work! 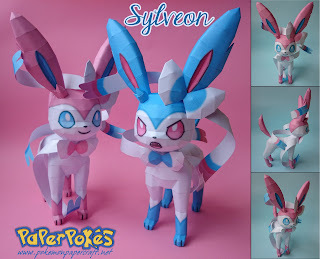 Even though Sylveon's model is available, I do not see it in here: http://www.paperpokes.ca/gen6.html? for some reason i cant open the file ;-; anyone know how i can fix that??? how do u get these? 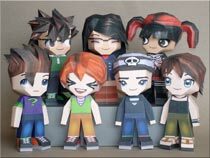 Hi all paperpokes team can i have the template for the chibi paperpokes team.I really want it so bad.